In Norse Mythology, Odin is the most powerful god of Asgard and the chief of Aesir (a clan of gods). He is the Alfather, the wise, the shapeshifter. Odin gave us runes by sacrificing himself to the fates on the world tree. And Odin, unlike many other male deities, persistently sought wisdom from females. 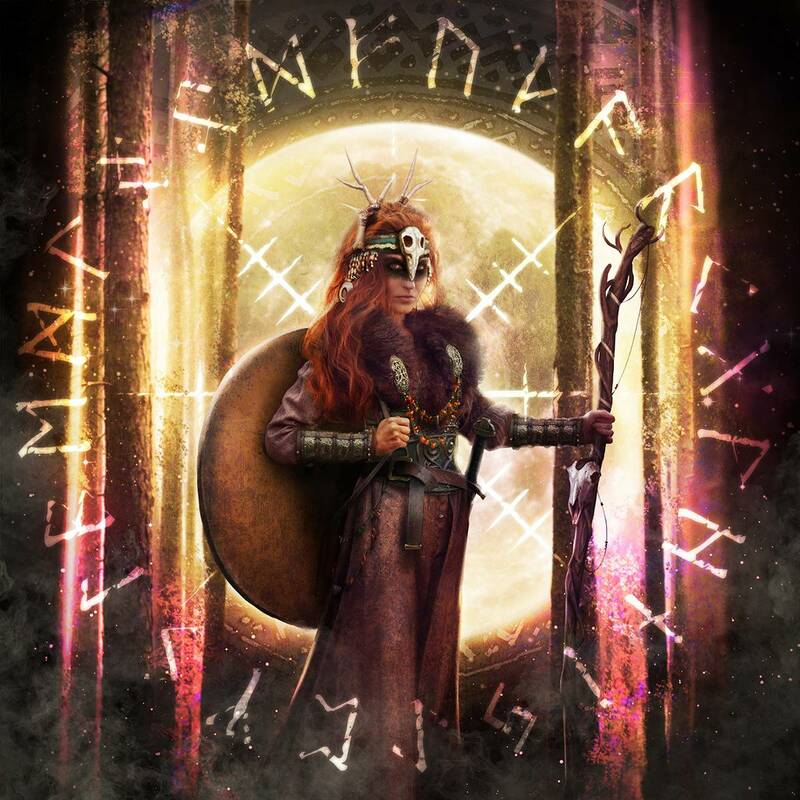 Freyja is the beautiful and powerful goddess of the Vanir (another clan of gods) who joined Odin as part of a peace treaty between the Vanir and Aesir. 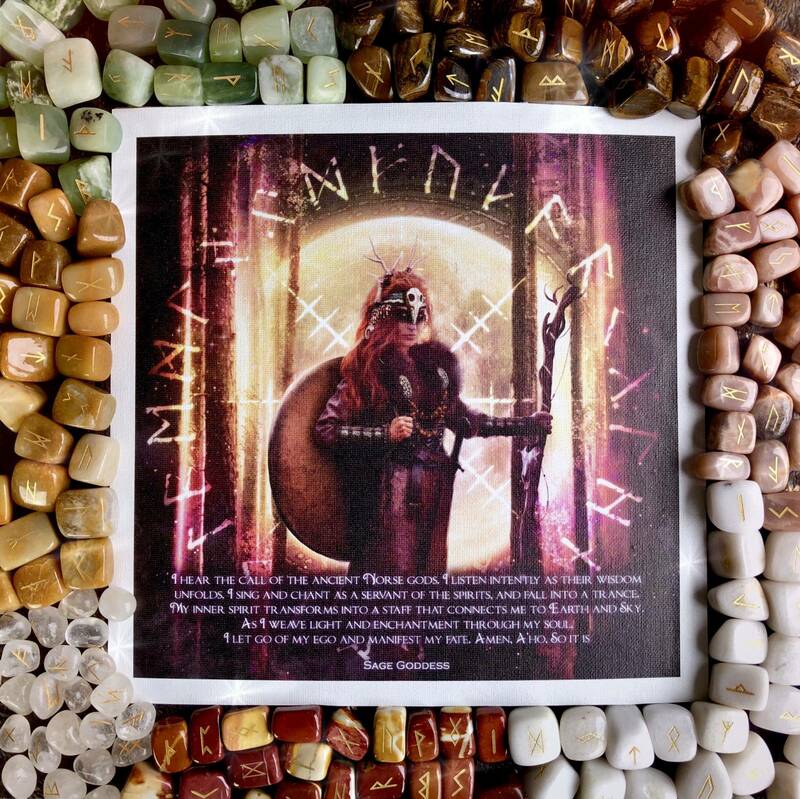 As a result, Odin and Freyja developed a close relationship, in the course of which, Freyja taught him Vanir magic called seidr in return for knowledge of the runes. 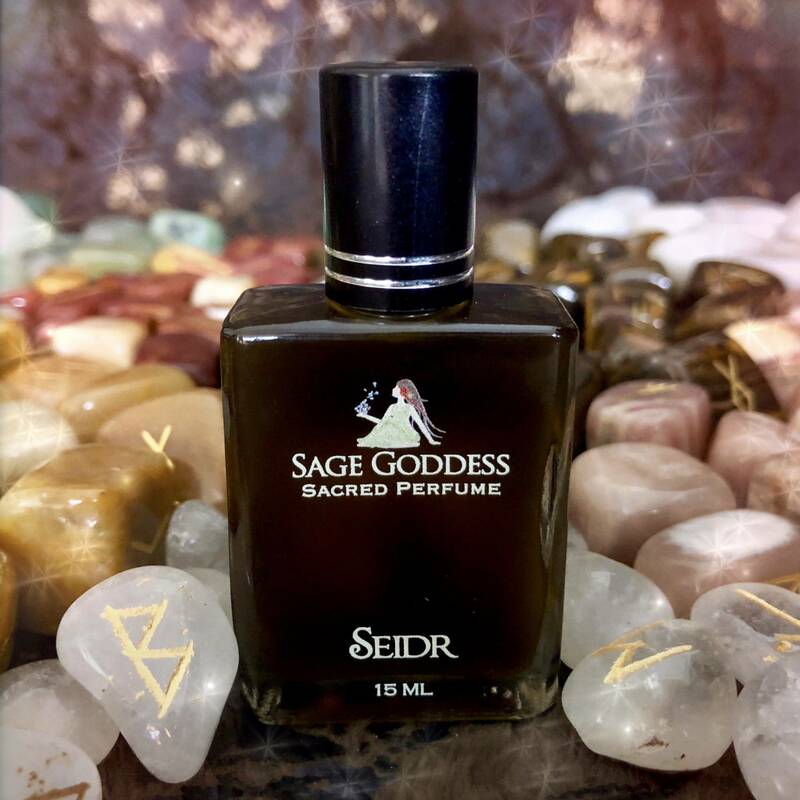 Seidr is shamanic magic that requires altering consciousness and raising energy. It allows you to change the course of fate by interacting with the spirit world and is practiced in three parts: seidr chant, seidr seat, and seidr staff. Chanting allows you to fall into a trance by activating a Higher energy. However, in order to obtain and fall into a trance, you must first let go of your ego by way of the seidr seat – a magical platform. And the seidr staff holds the direction of your journey while keeping you centered and cleansed. This staff is grounding, as it connects you to the earth and sky, much like the Tree of Life. It is important to keep your intentions simple, shamanic, and close to nature, so your fate will manifest. In this shamanic experience, it is the inner spirit that makes a powerful staff. 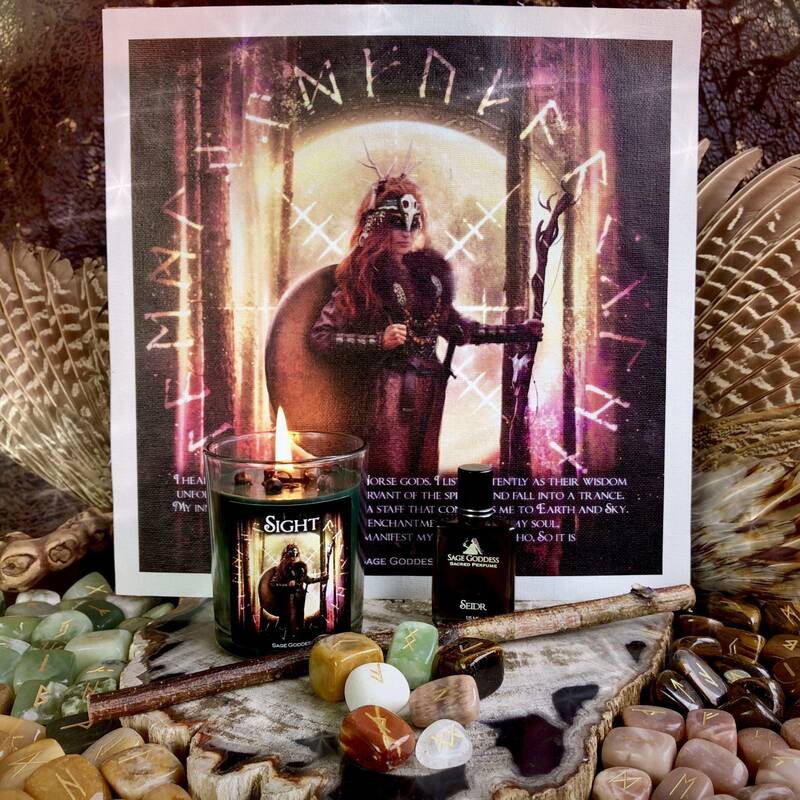 Join us for our Online and In-Person Ancient Norse Full Moon event here, and invoke the magic of seidr. I will guide you through old forgotten skills of chanting. With seidr, you will learn to let go through an out-of-body experience, therefore manifesting your fate. 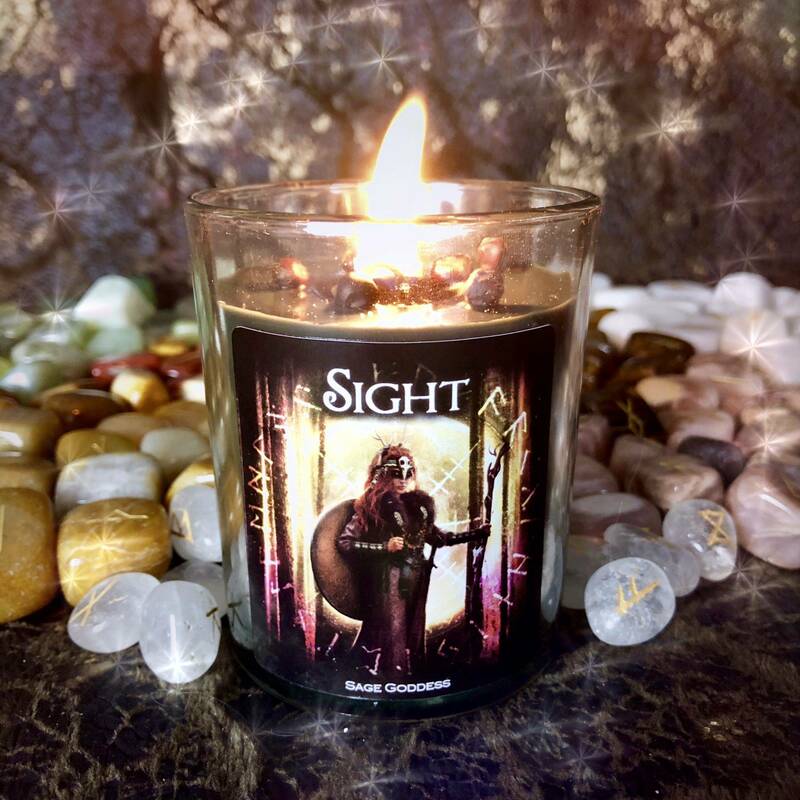 One (1) 6 oz Sight Candle, hand-poured with dark green wax topped with a tiger’s eye chip stone to invoke grounded wisdom and Divine protection. 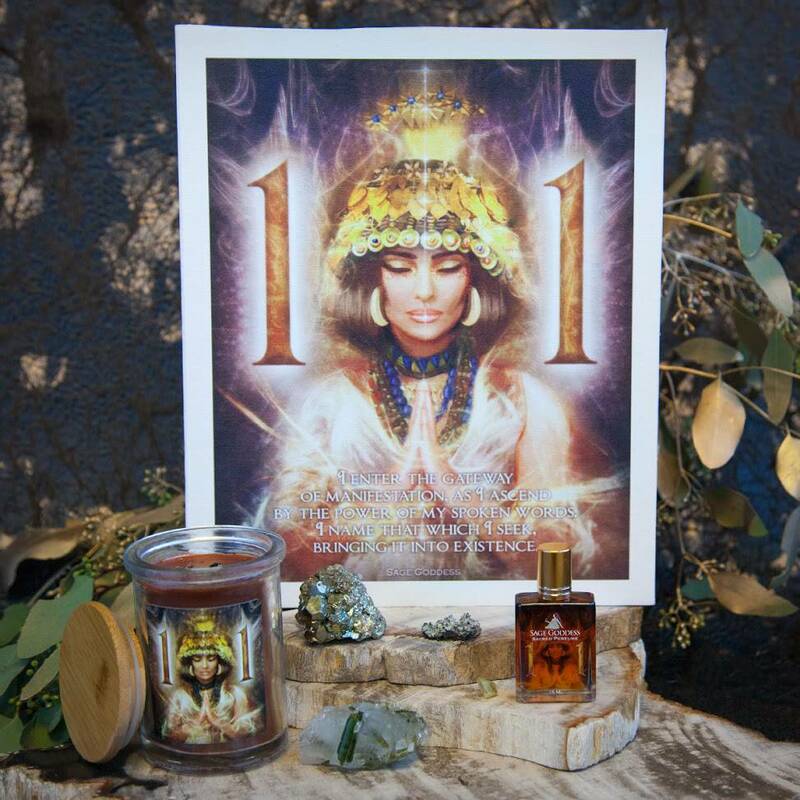 One (1) 15 ml bottle of Seidr Perfume blended and poured with notes of pine, oakmoss, and fir to connect you with potent Earth energy. Each bottle is infused with a tiger’s eye chip stone. 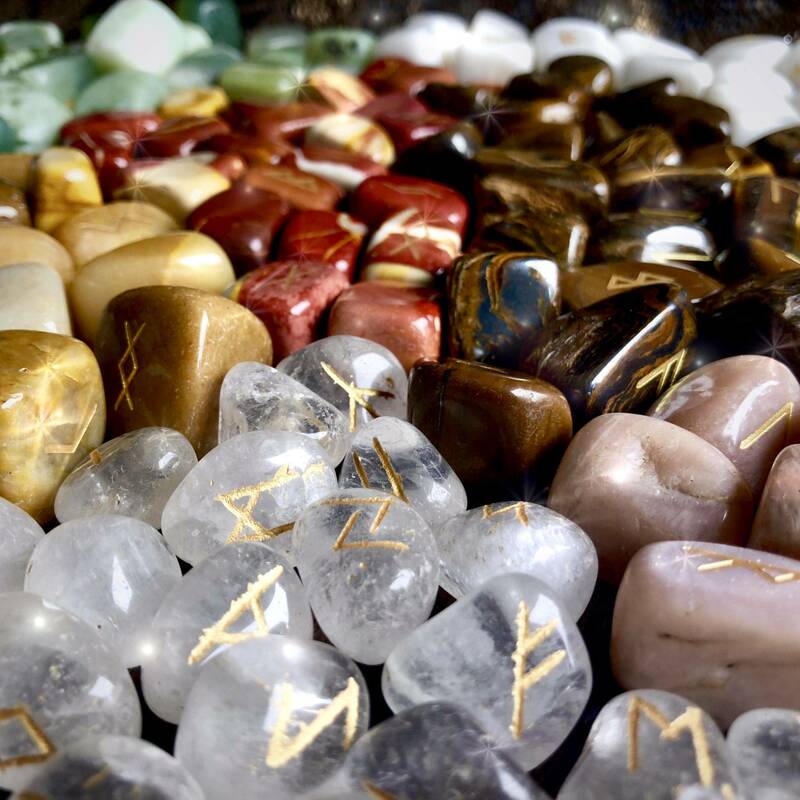 One (1) set of gemstone runes, intuitively chosen for you. We will choose from the following: mookaite jasper, jade, white jade, peach moonstone, tiger iron, clear quartz, and yellow jade. One (1) wooden wand (about 5”) to transmute and cast your energy into the spirit world. You also receive one (1) 10×10” rune casting mat with your set. This canvas art was designed right here at SG Headquarters by my talented team of graphic designers and carries potent energies of seidr. Place this canvas on your altar to invoke the magic of seidr. Note: The perfume in this set is made with natural essential and carrier oils, and may contain fragrance oils. Cap color, chip stone, and color may vary slightly. For external use only. Always burn your candle on a heatproof dish on a stable surface, and never leave a burning candle unattended. 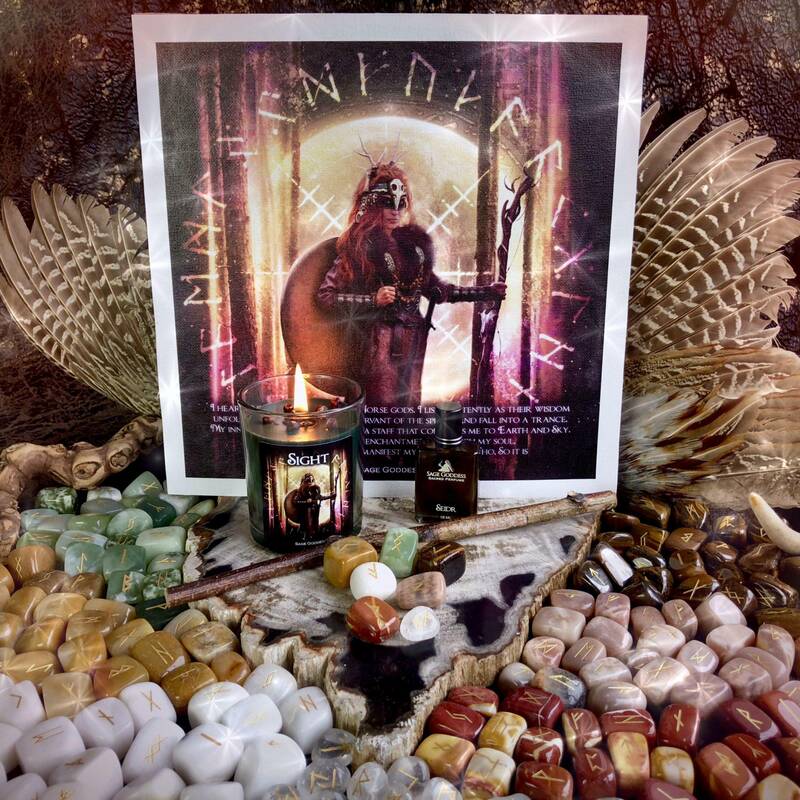 This listing is for one (1) Ancient Norse Full Moon Set: Seidr – Manifesting Your Fate. Yours will arrive lovingly parceled, along with a single leaf of white sage and a card describing the properties of the stone. You will also receive a special parchment with a skeletal chant, so you can fill in and recite what you seek. I am so so pleased with this set. I received the Jasper Runes, and I am excited to learn how to use them. As a “white mutt” with ancestors from Norway, Sweden & Finland, I felt particularly drawn to buy this set (it’s the first set I’ve ever bought from SG) and I am so glad I did. I feel a strong connection to the artwork, it’s stunning, and the smells of the candle & perfume take me home to the woods. Thank you so much SG team for your craft & thoughtfulness, it does not go unnoticed in these works of art! 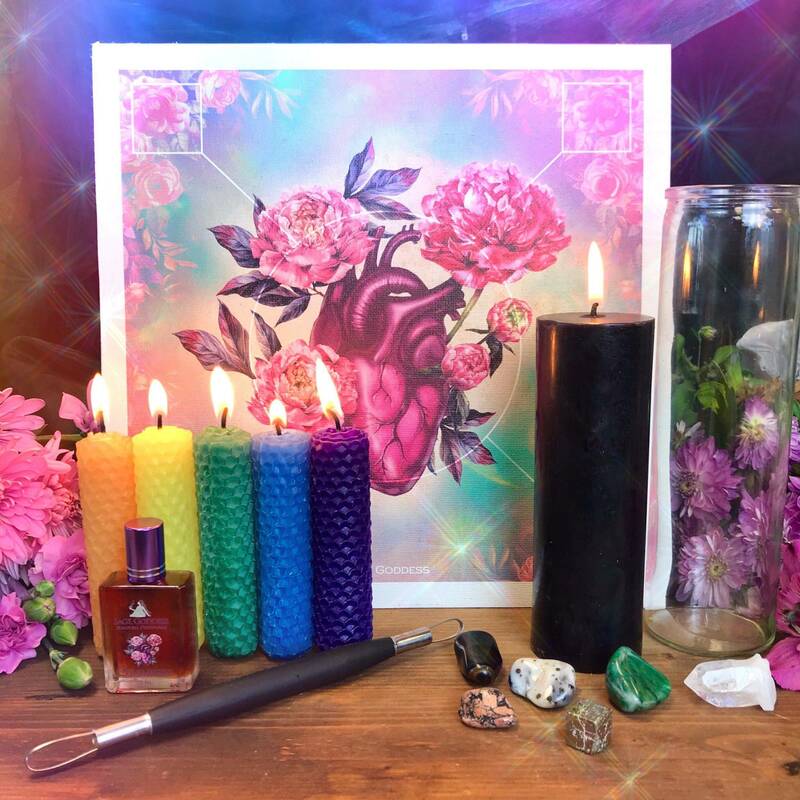 This is my favorite ritual kit of the year (don’t get me wrong – I love them all). The art on the casting mat has such an authentically ancient feel to it. The candle and perfume are delicious. And the Runes are Picture Jasper! I was hoping for Tiger Iron and when I saw these, that thought went right out the window. As Athena says, this or something better. I received the “something better”! This is an amazing set!!! Chills when the stones fell out! Feeling a connection with Freya & the artwork is so beautifully done. I received the White Jade rune stones. They are perfect since I already have Labradorite runes. Now I can pull one for the full moon with the Jade & one for the New Moon with the Labradorite. Also, the Seidr perfume and candle smell amazing. I love the beautiful Norse full moon set. 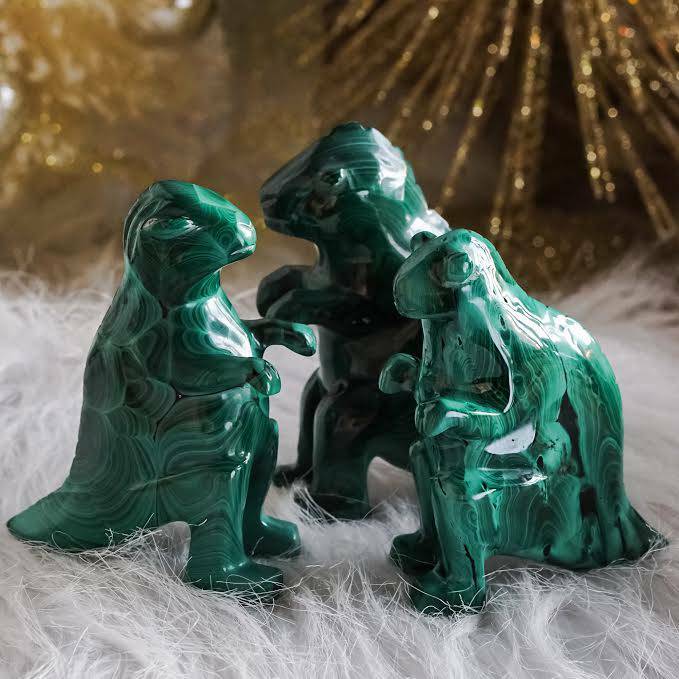 Mine came with stunning jade runes that I will treasure. I am excited for the full moon ritual coming up. I used the Seidr potion immediately and love the tree notes. This is probably my favorite set to date.